Last July I posted about a fairly new shoe brand called Heavy Machine (HERE) that I had fallen for. The unique designs and bright color palettes are something we don't see much of these days. The wonderful people at Heavy Machine contacted me a while ago to share with me their new collection-Spring/Summer 2011, so I could share with you. When I took a look my mouth started to droll. Last season's shoes were amazing, but this 2011 season is far more amazing than last! 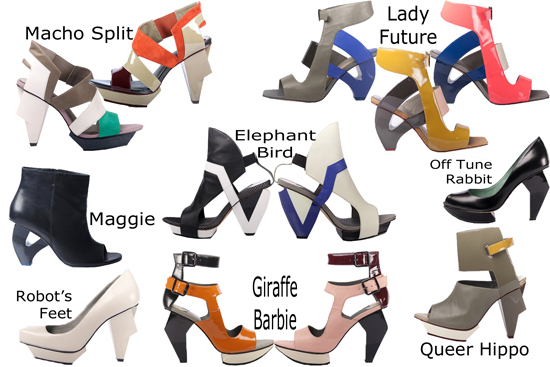 The heel designs grab me, the cut outs are fun, and the colors are gorgeous! It's so strange, just last year I was sketching shoes with crooked heels like this. It's as if they read my mind! I think my favorites are Pirate, Spectral Visitor, Giraffe Barbie, Macho Split, Lady Future, and Off Tune Rabbit. Take a look! What are your favorites?